Do you ever get a bloated sore tummy, or perhaps a little stiff in your joints, or just feel plain tired and spaced out after eating a meal loaded with grains, legumes, nuts and seeds? If you’re unsure, then pay a bit more attention to the feedback your body is giving you – try taking a break from these foods for a few days, or if that’s too tough, follow my suggestions below and see if you notice any difference. We often don’t realise how small changes to the way we prepare our food can make quite remarkable transformations to our digestive health. Grains (like wheat, rye, barley), legumes (like beans, chickpeas, lentils), nuts and seeds are all coated in toxins that are difficult for us to digest: phytic acid, enzyme inhibitors, lectins, polyphenols and goitrogens. In nature these substances are there to keep them safe from predators until they come across ideal moist and warm conditions to germinate. However, because we eat these foods before this natural process has taken place, our bodies have to break down the exterior toxins. Whether we are aware of it or not these toxins cause undue stress on our bodies – deplete our essential mineral and vitamin stores, block the absorption of calcium/magnesium/iron/copper/zinc in the intestinal tract, take loads of energy to break down, interfere with protein absorption and deplete amino acids. This can manifest in symptoms like digestive upsets, tooth decay, immune deficiency, skin irritations, mood irregularities, thyroid issues, stiff and swollen joints, sluggish energy levels and anxiety. I am not a huge advocate of eating grains especially those containing gluten (wheat, rye, barley, oats…) as there are no nutrients in grains that are not found in other foods. Vegetables, fruits, healthy fats, fish, meat, eggs etc. are all easier to digest and offer many more nutrients. However, if you are going to eat grains then it is very sensible to mimic nature’s germination process by soaking them. Less digestive tract inflammation as the toxins have been neutralised and released = less digestive pain and bloating. A healthier gut means you’re less likely to suffer from anxiety, depression and irregular mood patterns. Increase of naturally occurring digestive enzymes = increased metabolism and reduced use of our own body’s enzymes so they can be put to use for a whole host of better things! Cover with fresh warm water, add between a tsp and tbsp of good quality salt, or apple cider vinegar, or lemon juice to help break down the toxins even further. Store in a warm place. After soaking, you drain them, rinse them, then either cook or dry them out. If you want to get even more out of your grains you can let them sit out for a couple days so they sprout (rinse and drain them a couple times each day until sprouts emerge). Soak for 24 – 48 hours. Change the water 2-3 times. Soak for for 12 – 24 hours. Change the water once or twice. 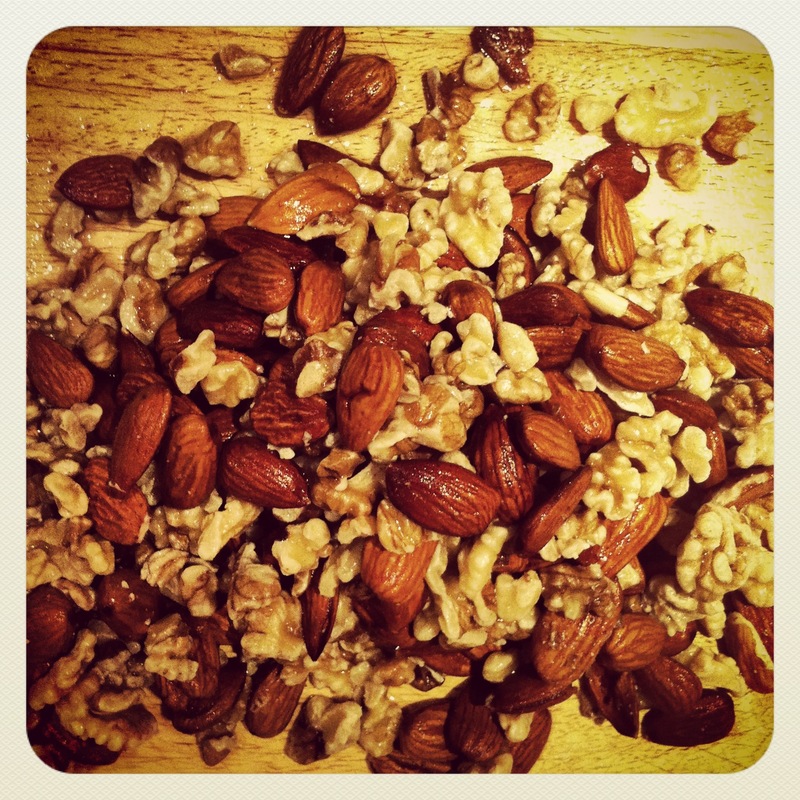 Soak hard nuts for 12 – 24 hours, drain off the water (do not rinse them) and pat dry. Lay the nuts out on a baking tray and dry in a dehydrator or an oven on the lowest possible setting* for 6 – 24 hours (until all moisture is removed). *Less than 65 C; for gas ovens – on the pilot light. Soak seeds and soft nuts for no more than 6 hours, drain (do not rinse them), pat dry. Lay the nuts out on a baking tray and dry out at room temperature, in a dehydrator, or in an oven on the lowest setting. If you are struggling for time to dry out your nuts and seeds then go to your local health food store and seek out some activated nuts and seeds – here are my favourite brands I’ve tried from London, New York, New Zealand, Australia. Please message me if you can recommend good quality activated nuts in your area so I can add them to the list!